Faus Laminate Flooring has developed more laminate flooring technology than any other company in the world. And they're not stopping there. They have just expanded their Fausfloor® line to include additional fashion-oriented collections and exclusive patented technologies that no one else in the industry can offer. Always a step ahead, Faus Laminate Flooring brings advanced expertise to the industry by offering patented products and features that take laminate flooring to the next level. If you've ever walked on a laminate floor, chances are good you've benefited from the tireless research and development Faus Group has put into our technology. Our MicroBevel® and Joint Guard® technologies work to greatly improve the durability and longevity of today's laminate floors. InterPlank® and Embossed-In-Register® make laminate floors so realistic looking you'll have to get on your knees to tell it's not real hardwood. And the new LongStrip™ design takes that realism to a level you'll have to see to believe. Finish it all off with the easiest, most versatile trim and transition product ever created - FasTrim™. This amazing 5-in-1 system puts the perfect finishing touch on a beautiful floor. Even more amazing are our newest design innovation breakthroughs - FastDesign™ and Multi-Direction Design™. They are truly revolutionary. 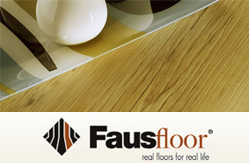 With Faus, you're getting more than just laminate flooring. You're getting real innovations and real technologies. You're getting real floors from real leaders.